I stood at the Too Faced section in Sephora for 20 minutes hemming and hawing which palette to get. 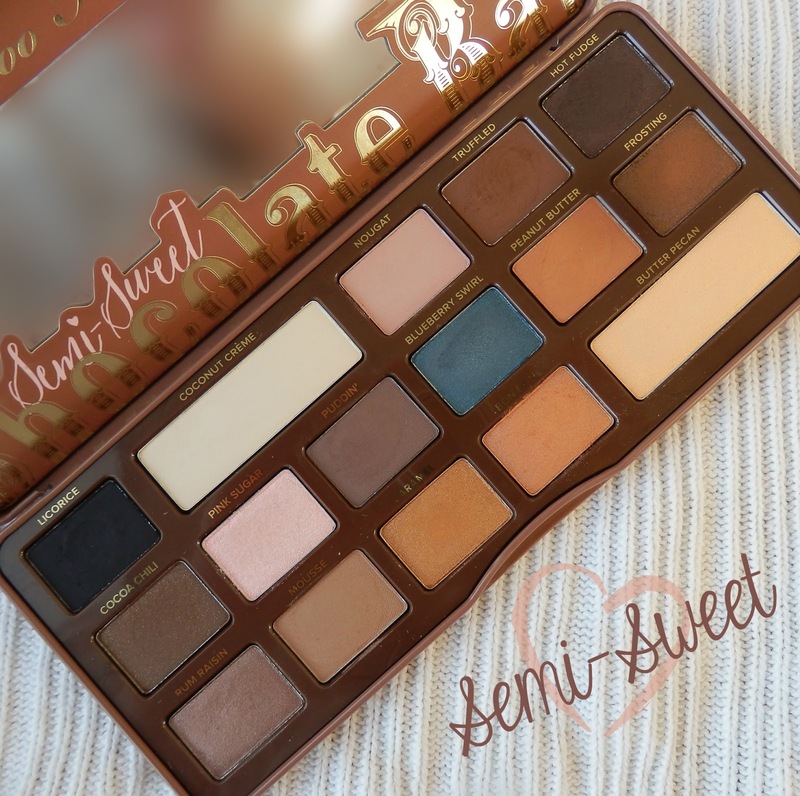 Swatches galore...Chocolate Bar Semi Sweet Chocolate Bar Semi Sweet…. Aggghhh. In the end, Peanut Butter made me do it. The smooth orangey brown matte shadow was the kicker in this decision. 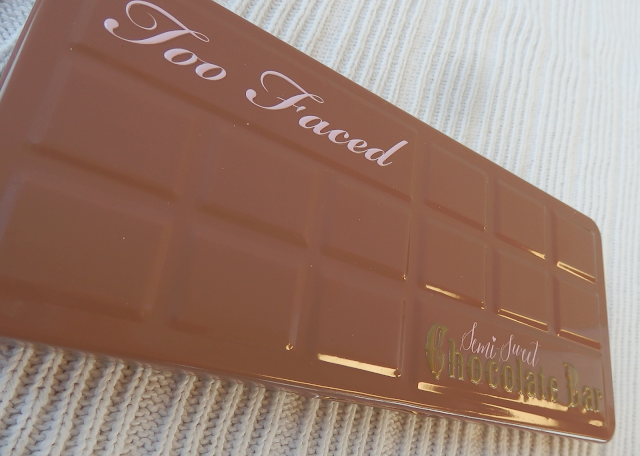 I loved it so much that I decided I had to try the Too Faced Semi Sweet Chocolate Bar palette ($59 CDN) first. I say first because I was so impressed that I am going back before the end of the month to pick up the original Too Faced Chocolate Bar palette. Gots to get me some more chocolate!! Can you believe this is my first Too Faced palette? What the what? As are most Too Faced palettes, the packaging on this one is very cutesy. The chocolate scent that accompanies these palettes is so heavenly but that is just one factor in this why this palette is so awesome. The durable tin casing looks like a giant milk chocolate candy bar and it feels solid enough to travel and is light enough to just toss in my purse (which I have done). The Semi-Sweet Chocolate Bar palette comes with 16 eyeshadow shades that are in a nice variety of matte, satin, and shimmer finishes. 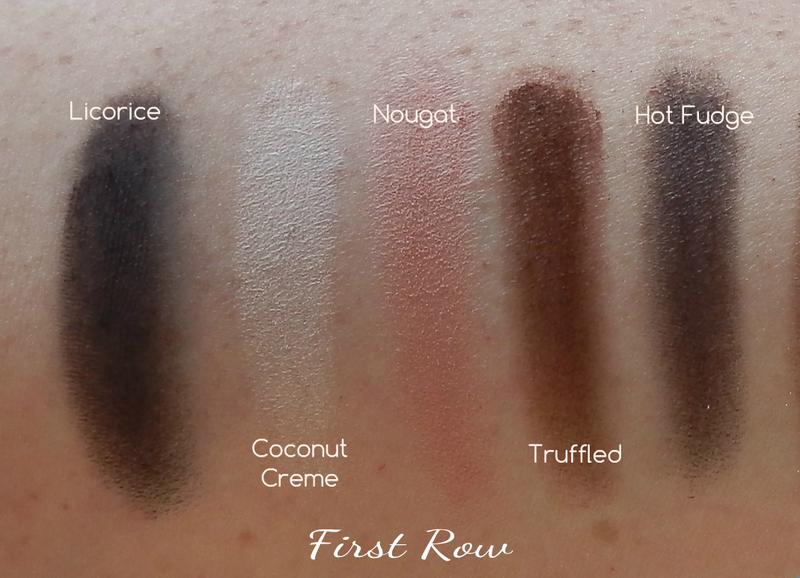 This is largely warm neutral palette but there are a few cool tones to satisfy most Makeupnuts. The pigmentation of most of the shades was pretty intense. There were 2 shades that weren`t so pigmented; Pink Sugar,a pink glitter overlay, didn't really have an opaque base colour so it is pretty much a glitter topper. Blueberry Swirl came out like a blacken metal blue. Unless packed on in layers or applied wet it was on the sheerer side. The formulation of these shadows made me do a little giddy dance, they were so good. 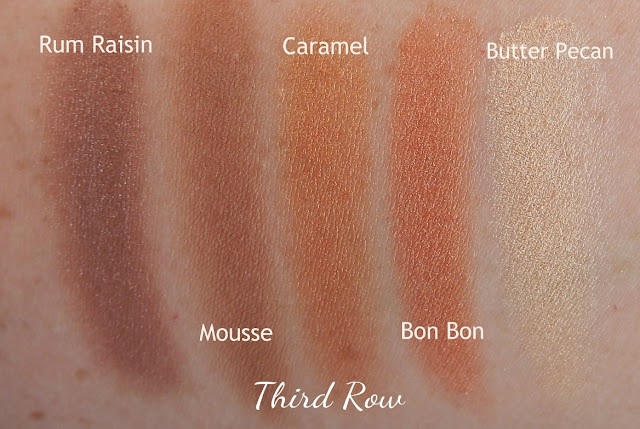 Most of the swatches below are just one swirl in the pan. The mattes are probably some of the best I have tried to date. 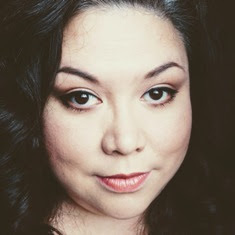 The only matte I was a little meh about was Coconut Crème because it was a little chalky. But it is one of my most used shades. I use it as an all over eyelid shade. It needs to be built up to be opaque but it works well and has no fall out. 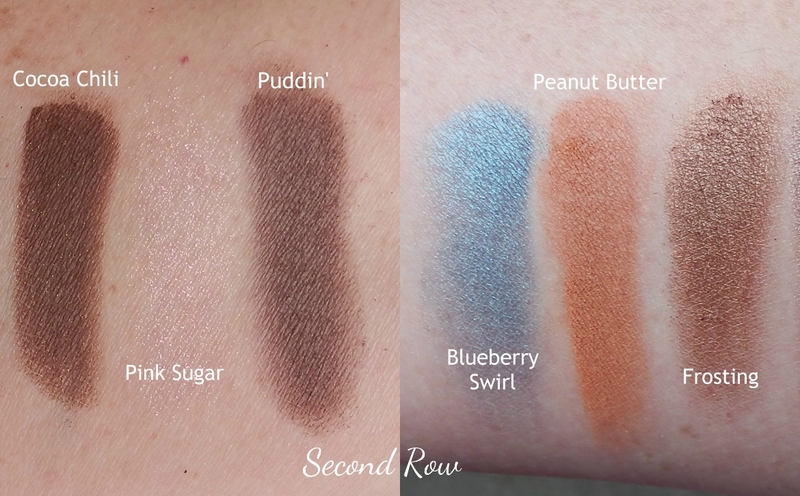 Unlike the original Chocolate Bar palette, the Semi Sweet Chocolate Bar palette came with all the names of the shadows printed below each shade. It also included a Too Faced Get the Look insert. Which I promptly lost. I am pretty sure Sami has it stashed under the bed. Perhaps the start of a Too Faced nest? I simply loved the formula and the cocoa smelliness of this palette. When I first got it I just kept sniffing it. I don’t really notice it too much anymore. The smell is still there but I think I have become nose blind to it.